Removes the complications, which is worth it, honestly. Absolutely nails classicvania after the travesty of the second game. The additional playable characters provide a great variety in how you can play the game, with multiple paths to choose from on each playthrough. While it still has some of the annoying aspects of previous games such as climbing stairs and the knockback, the level design is full of polish and it boasts some of the best boss design in the series. 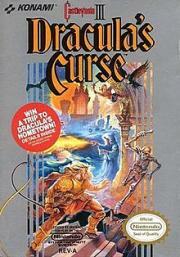 Not only one of the best Castlevania's but also one of the best NES games ever. Quite enjoyable NES platforming action that takes the bones of the original but manages to add a bit more meat to it with alternative characters and whatnot.